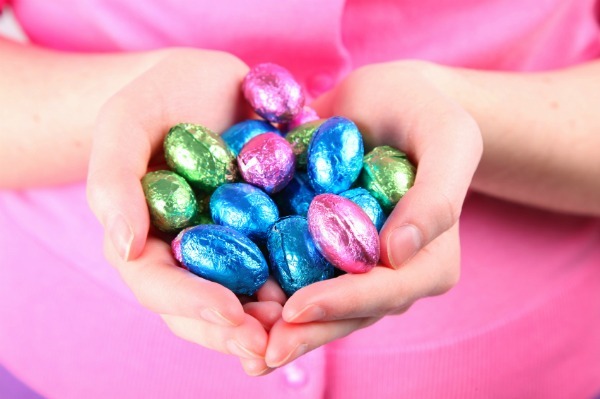 Chocolate eggs, chocolate bunnies, chocolate bilbies, hot cross buns… Ahh, just one more? No ladies, it’s time to put that family sized block of chocolate down and learn how to control your willpower this Easter weekend. Your kids might have made themselves sick on chocolate and your brain might be obsessing over chocolate, but if you want to survive the Easter long weekend without completely losing your willpower (and putting on an extra 10 kilograms), then follow these surprisingly easy tips and tricks to nip your choccie cravings in the bud. It’s always the way… You try to deprive yourself of something and then it’s all you can think about. (A man? A slice of cake? A dress?) The key here is to enjoy your Easter treats in moderation. You don’t need to go overboard and start ordering in a chocolate fountain for one, but savour a few small eggs throughout the day and be satisfied with what you have. Instead of giving in to the commercialism of the holiday, why not set up new rules for Easter gifts? No eggs for Mum this year — why not ask for handmade crafts from the kids instead? Alternatively, establish new traditions like everyone gives non-edible treats, or set limits like one egg for each adult. Get creative and think outside that chocolate-covered square. OK, so you may already realise that you’re the kind of person who simply needs their chocolate on Easter Sunday, but try a bit of portion control and enjoy just a few better-quality eggs instead of a huge bag from a discount store. Opt for darker chocolate as it offers more antioxidants than milk or white varieties. Fruit dipped in chocolate is another delicious way to get your chocolate fix while also enjoying the benefits of fresh fruit — check out our recipe below! Line a baking tray or chopping board with baking paper. Place the chocolate in a microwave-safe bowl and cook it on High in the microwave for one minute. Keep a close eye on it and stir at short 10-second intervals until melted. Dip the pieces of fruit into the chocolate so they’re about half-covered. Drip off the excess and place them on the tray, then pop in the fridge for about 10 minutes until set. It feels like the second the Christmas tinsel is down, Easter eggs and hot cross buns start lining the supermarket shelves. But flex your willpower and hold out until Easter Sunday. Even on the weekend, limit your treats to one day instead of stretching it out to four days of feasting. Associating food with ideas of “good” and “bad” and feelings of guilt can be dangerous to our relationship with the life source. Remember that food is like medicine — you need to feed your body with wholesome, quality foods that will give you sustenance and nourishment. It’s essential and shouldn’t be a burden. Appreciate the benefits food brings and enjoy it in moderation. When did the humble Easter egg become more about shoving too much chocolate down your gullet than its original notion of “a new beginning?” Whether you delve into the day’s religious meaning or not, the egg itself was supposed to symbolise “new life.” which might be more inspirational to muse over than how much chocolate you can consume in one day! Savour what you do have!